Randolph College has announced the addition of a new master of fine arts program in creative writing. The first semester is set to begin in July 2018. The two-year, low-residency M.F.A. program is the first of its kind in Virginia, and will provide an immersive, personalized experience for students of all ages and backgrounds. 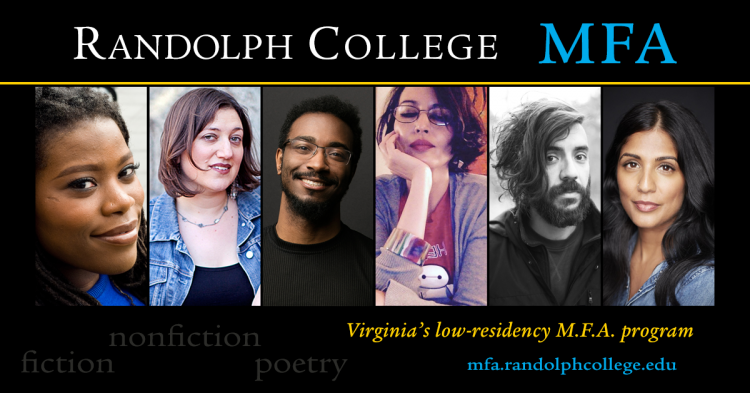 The first semester will begin with a 10-day residency on the Randolph College campus, where students will participate in intensive discussions, lectures, workshops, readings, and panels focused on creative writing. Following the residency, each student will work for 20 weeks to complete original new writing, revise works in progress, and write critical analysis essays. Throughout the process, students will work closely with the program’s diverse, award-winning faculty. The program’s first core faculty members include Kaveh Akbar, Kaitlyn Greenidge, Mira Jacob, Aviya Kushner, Layli Long Soldier, and Phillip B. Williams. Three specialize in poetry and three in fiction/nonfiction writing. Akbar is the recipient of a Ruth Lilly and Dorothy Sargent Rosenberg Fellowship from the Poetry Foundation, a Pushcart Prize, and the Lucille Medwick Memorial Award from the Poetry Society of America. He is the author of the chapbook, Portrait of the Alcoholic, and his latest poetry collection is entitled Calling a Wolf a Wolf. Dop is also eager to get started and has dreamed of starting this kind of program since he was working towards his own M.F.A. degree at the University of Nebraska. Like Randolph’s undergraduate curriculum, Dop believes that close relationships between students and professors will be one of the defining characteristics of the College’s new M.F.A. program. For more information or to enroll in Randolph’s M.F.A. program, please visit http://mfa.randolphcollege.edu/.